This blog entry is part 2 of a 2 part review of the Rosemount Cellar Door. 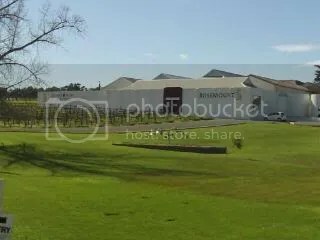 Check out my Rosemount Cellar Door Review Part 1 . This entry is reviewing the desert/fortifieds plus their flagship range. The Flagship Wines tasting costs $12 which includes a generous tasting of the 3 wines plus nibbles. It should be noted that the tasting fee is refunded if you purchase any wines from the Flagship range. Note that the prices are volume related so the prices below are set as (1 bottle price / 6 bottle price / 12 bottle price). I was expecting a liqueur style wine and this is not it. The wine is a lighter fruit driven style that has hints of candied peel on both the aromas and flavors. The wine is not viscous but has high acid levels as the wine has a clean finish. This is a blend of 2007 & 2008 wine. The 2007 has been stored in old oak (which I did not find obvious) with the 2008 portion being oak free. Most deserts would work well with the sweetness of the wine. A blend of Shiraz, Cabernet & Tokay with an average age of 10 years. The wine has lost any red tones and is quite light garnet colour. This turns into a luscious nutty, sweet, mouth coating liquid that leaves the mouth with a dry finish. Quite a classy style and the current stocks are from a returned overseas order. There is not much of this made, however there seems to be a small dedicated group that just loves “their Old Benson”. Bring on the after dinner chocolates to consume with this one. This Hunter Chardonnay is just as I remembered it from a previous tasting over 5 years ago. The Chardonnay is very different to those I have been tasting from McLaren Vale. The melon character is there but there is loads of stone fruits (peaches and nectarines) and a lovely balance from the fermentation and 11 months in french oak. The oak provides a nutty and almost viscous mouthfeel that just keeps on giving after you have swallowed. This is one of the best Chardonnay’s I have had this year. For those that know the wine would consider the price to be acceptable for the quality. As seems to be the case for Australian Chardonnay – this wine will be phased out with the Roxburgh Vineyard I believe has been sold. The texture of this wine would go well with a Prawn Cesar Salad. Now I was looking forward to this – a classic Australian blend from a region that is often seen as a poor cousin to the Hunter Valley. A very interesting wine that has red fruits dominating the aromas but flavors are dominated by black fruits. The 15 months in oak (both French & American) contributes to the silky smooth tannins and chocolate flavors that cause an exquisite complex wine. If this what Mudgee can produce that I should check out this region’s wines more often. For me this was the best wine from the whole Rosemount range tasted on this day. How about a stout and beef pie with a bottle of this while with a loved one in front of an open fire. I found the aromas were a little closed which may have been due to the wine being opened just prior to being poured for this tasting. The aromas did seem to be lifting with a short time in the glass before I drank it. This is just what McLaren Vale Shiraz should be – black fruits with a hint of dark plums. There is a deep spice here – the closest I can get is Star Anise and a real layered tannin structure. There has been smart use of oak here with 18 months of new oak maturation – 20% French and 80% American. This is interesting as I would have thought the wine was mainly matured in French oak with little vanilla oak characters one normally expects from American oak. The complex structure here would lend itself well to game meats – maybe try a seared kangaroo fillet with lots of mushroom sauce. This entry was posted in Mclaren Vale, wine and tagged cellar door, Chardonnay, Mclaren Vale, McLaren Vale Wine, Shiraz, wine, wine McLaren Vale. Bookmark the permalink.